Undertake an evaluation to select a supplier. 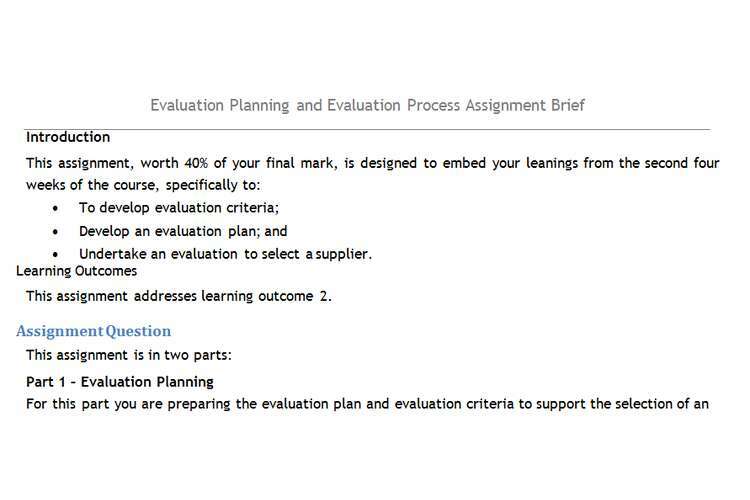 Learning Outcomes: This assignment addresses learning outcome 2. For this part you are preparing the evaluation plan and evaluation criteria to support the selection of an airline (or airlines) by your organization for Regular Passenger Transport Services (RPT flights) for personnel (and where relevant, contractor personnel). Travel up to and including 6 hours is economy class, otherwise business class. When choosing weightings remember they need to reflect the relative importance of the items against the historical data and your organisation’s values. This will drive the resulting negotiation strategy. Provide a statement (or statements) justifying each allocated score. References to support your material must be included. information in a logical order. unambiguously describe the criteria and rationale for their inclusion and weightings. and/or a set of calculations. steps or calculations that will result in the best long term result. from their websites. Must include a logical scoring system.